The current production of Arms and the Man at Constellation Theatre seems to validate Shaw’s view that nothing works as the romantics say it should. The play is set during the Serbo-Bulgarian War and centers on the Petkoff family, particularly, Raina, (Amy Quiggins) the young, impressionable daughter who is engaged to Sergius Saranoff, (Mark Krawczyk) a supposed war hero, but a fool in practical situations. The charge he leads is a success because the enemy had been given the wrongthrough Raina’s window, Captain Bluntschli, (Michael John Casey) a Swiss mercenary who fortifies himself with chocolate instead of bullets. He recognizes a sympathetic depth in Raina, and persuades her and her mother, Catherine, (Ellen Young) to hide him, and after the battle subdues, sneak him out. Raina’s father, Major Petkoff, (Chris Mancusi) the commander of the Bulgarian army, so unknowledgeable of military maneuvers, cannot retrieve his troops from the war. When Bluntschli retu ammunition. Raina supposedly idolizes him, but she is an unconscionable liar, and Sergius, clandestinely, makes love to Louka, (Brynn Tucker) the servant girl. When Bluntschli returns after the war, no longer an enemy, the romantic situation heightens and a resolution gained. 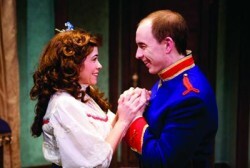 Amy Quiggins and Michael John Casey in 'Arms and the Man.' Photo by Scott Suchman. Director, Allison Arkell Stockman chooses to strike the pitch of the production exceptionally high. Mark Krawczyk is appropriate and engaging in this mode. The actors play their parts in bold farcical style, with the exception of Michael John Casey, who acts more organically. He does balance out the frenzy, as does Chris Mancusi, in this small black box theatre, providing relief from the high-pitched tenor of the other actors. Amy Quiggins initially presents a charming and endearing effect as Raina, but her performance is obstructed by the extremes she delivers in voice and action. One wishes for more of a variation in the performances, a balance so that themes of romanticism, class and the idealization of war, the director obviously strives for, may be attained, and resonate in today’s militaristic climate. Brynn Tucker and Mark Krawczyk in 'Arms and the Man.' Photo by Scott Suchman. A.J. Guban’s set design is magically transforming and his lighting design complements the action of the play, as does the music by composer Jesse Terrill. Kendra Rai’s costumes are romantic and delightful. Arms and the Man plays through November 20, 2011, at Source – 1835 14th Street, NW, in Washington, DC. For tickets, call (800) 494-8497, or purchase them online. 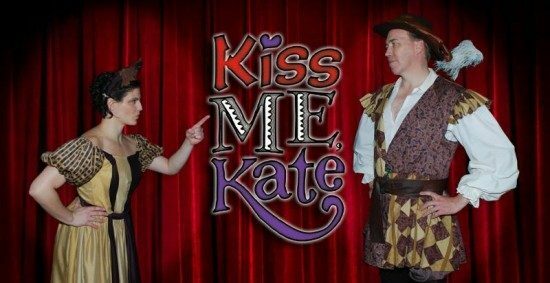 K. J. Crane earned a BA in History, studied Drama and English in the Graduate Drama Department at Villanova University, and earned an MFA in Playwrighting from Catholic University of America in Washington, DC. She has acted and directed, chairing Drama departments in New York and Washington, DC on the high school and college level. She worked with the National Theatre of the Deaf at the Eugene O’Neill Conference in Waterford, Connecticut. She has had two of her full-length plays staged at the experimental theatre at the State University of New York at Stony Brook. In December of 2010, The Fells Point Theatre in Baltimore produced a scene from her full-length play, GREGOR MENDEL in it’s Eight Scenes Productions, and in April, she had a staged reading of GREGOR MENDEL at The Lambs in New York City under the aegis of the Oberon Theatre Ensemble. Her screen play, THE KNIGHTHOOD OF MAC STEINER, was awarded Second Place in the international HOLIDAY PLAY COMPETITION in 2010, and it was a quarter finalist in the INTERNATIONAL CINESTORY COMPETITION in 2011. She has worked as a relief worker in war torn countries of Iraq, Bosnia, Guatemala and Haiti for twenty years, and co-authored a documentary of the Gulf War, CHILDREN OF THE CRADLE, which won the Long Island’s Film Festival’s ‘Best Documentary Award’ in 1993. She has been Drama Critic for the Westender in Hartford, Connecticut and currently critiques plays for the Oberon Theatre Ensemble in New York City. She is the Director of The Children’s Scholarship Fund for Girls. She is a member of the Playwright’s Forum of Washington, DC and the Dramatist’s Guild of America.